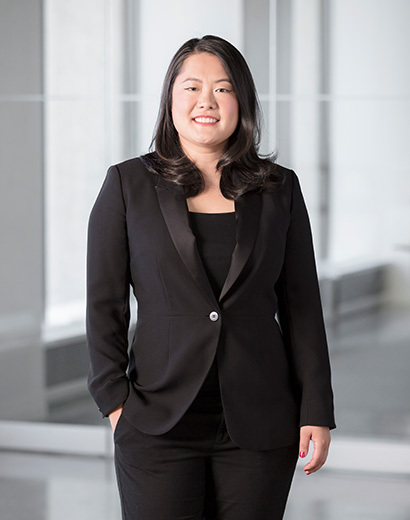 Bo joined our firm as an associate in 2013 after completing her articles at a large Vancouver law firm. She practices in the area of general insurance litigation and has a wealth of experience in coverage and transportation cases. On many occasions, Bo has appeared on behalf of clients and assisted counsel on matters before the Provincial Court of British Columbia, the Supreme Court of British Columbia, and the British Columbia Court of Appeal. Bo has also represented clients in matters before the Residential Tenancy Branch and the Workers’ Compensation Appeal Tribunal. Bo’s days are spent delving into complex legal issues, dissecting the facts and creating strategies that lead to resolutions that all parties can be happy with. She is a compassionate individual and an expert problem solver—and she is adamant about finding fair and cost-efficient outcomes for her clients. When she’s away from the office, Bo likes to relax by exploring Vancouver’s gorgeous seawall, trying out new restaurants with friends and traveling.